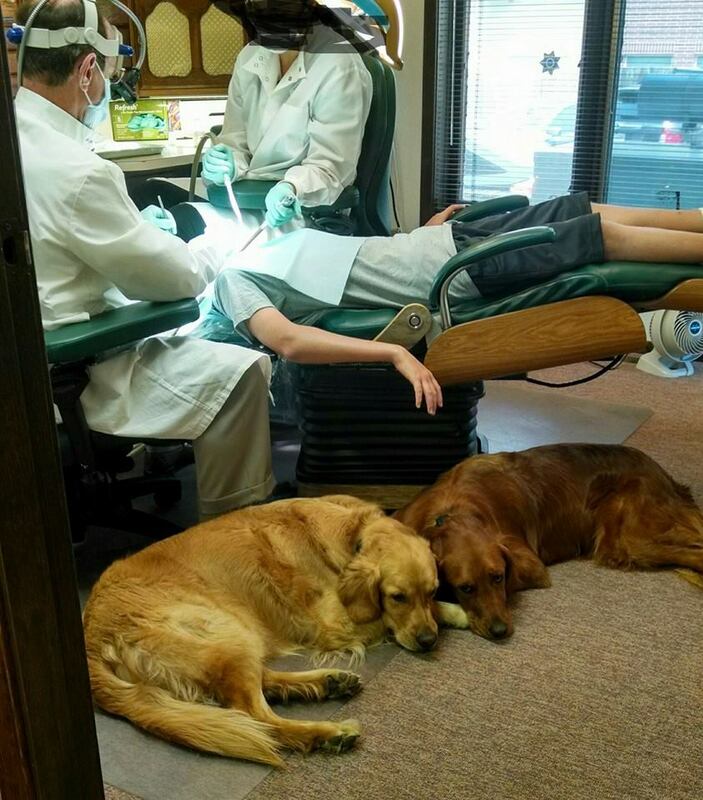 The days start pretty normal for these furry therapy friends. As soon as they come in, Amber heads right for Beverly to get some petting time. Rowdy goes straight for the break room to make sure we didn’t leave him any morsels. He does this when they come back from lunch too. He’s been known to get a hold of some human food from time to time. Rowdy will eat pretty much anything. Sometimes we leave him a little treat after lunch, but he has to play hide and go seek to find it! Amber and Rowdy participate in our morning meeting. 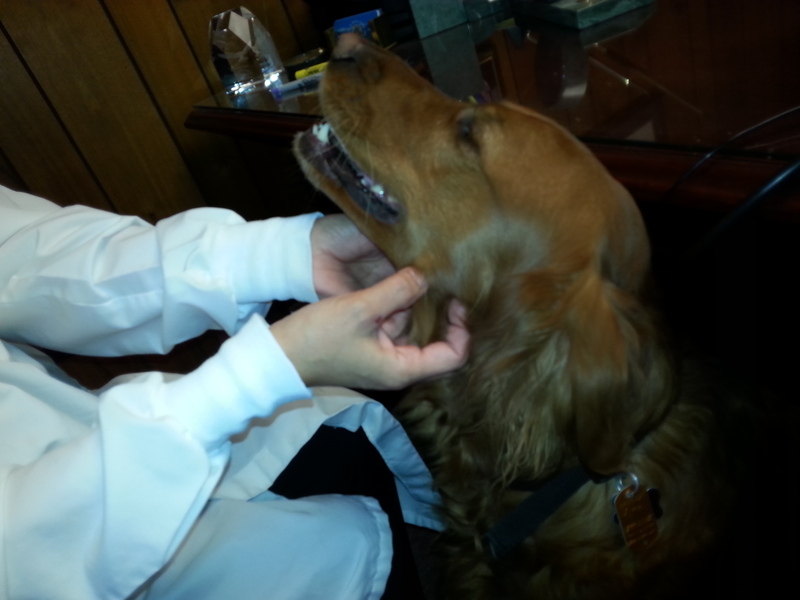 Amber makes sure she gets lovin’ from Beverly and Rowdy usually just hangs out under Dr. Bentz’s desk. After a while Amber and Rowdy get a little rambunctious and start playing tug-of-war. 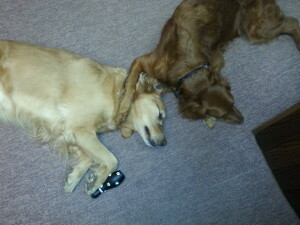 Amber tends to drag Rowdy across the room and he eventually gives up. Sometimes she will even put him in a choke-hold. Or, they will do the famous stare down where neither of them will give up. They even fall asleep with the toy still in tug-of-war position at times. Rowdy likes to hold the patient’s hands in order to keep them comfortable. 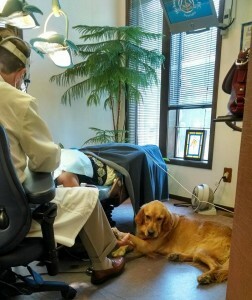 He goes from room to room in order to comfort the patients. 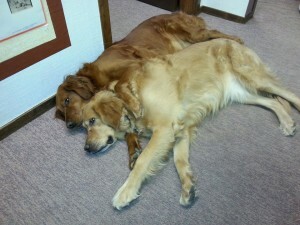 Sometimes Amber joins him in comforting the patient. At the end of the day Amber and Rowdy love on each other and then it’s time to go home. Our wonderful therapy dogs have such a great life. They get loving from all of the patients, treats, and best of all, they get to come to the office and hang out with us all day every day! 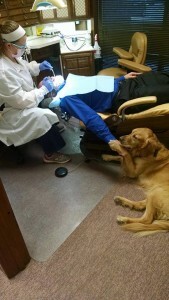 If you would like to meet our amazing Amber and Rowdy, give us a call today!